Hector yawns, and takes a large gulp of his Coca Cola. He’s browsing the web, skimming articles to share on Twitter and Facebook. But man, some of these articles are sooooo uninspiring. Have you ever read a blog post and got to the end wondering … What’s the message? What have I learned? Or did you click away long before you got to the end? Keeping readers engaged can feel like a tough job. We all get distracted so often. But engaging your readers becomes a lot easier when you apply visual thinking tools to your writing. Have you heard of painting pictures with your words? Well, that’s only a small part of visual thinking. Visual thinking involves more than describing scenes in vivid details. Research by cognitive scientist Maria Kozhevnikov discusses a second set of visual thinking skills: the ability to recognize patterns and spatial awareness. I think of this skill set as map creation skills. Both visual thinking skills—painting pictures and map creation—can help us improve our writing and engage readers. Without the need to become accomplished artists. 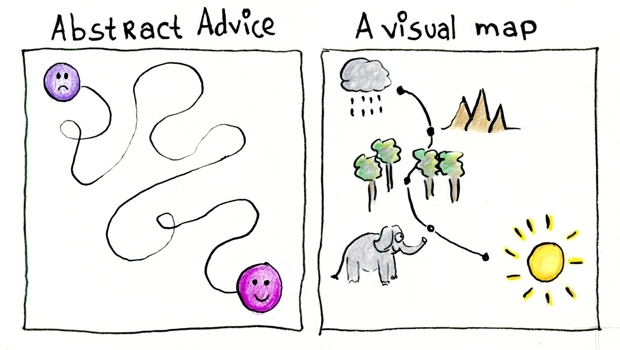 Visual thinking is natural, even for writers. Recent research by Harvard scientists suggests that even when we try to think in words, imagery still pops into our mind. For a long time, we understood our world visually, so maybe language is an add-on. What’s more, visual thinking may even boost your creativity. While a lot is still unclear about how we think, narrative research indicates creativity flows when visual and verbal thinking meet. That doesn’t surprise me. I’ve often found that when I’m stuck with writing, drawing (or scribbling) can get me unstuck. 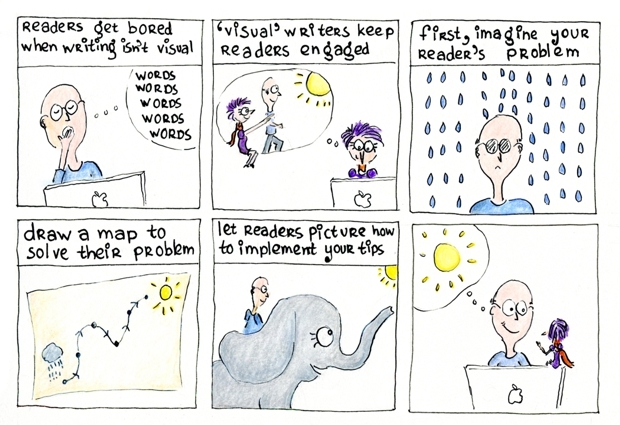 Want to use visual thinking to improve your writing, too? As a business writer, you’re a mentor to your reader. You tell him you understand his problems, explain how to solve them, and encourage him to implement your advice. Each blog post, for instance, is a route description. You guide your readers from a difficult situation via clear lessons to an enjoyable destination. A business coach, for instance, may help readers vet ideas for their business—she guides them from a state of confusion with too many ideas swirling in their mind to a situation where they feel excited about testing one specific idea. And an interior designer could help readers understand color schemes, so they can feel more confident choosing paint and fabrics for their new living room. Some writers love detailed maps. Before they start writing they draw such a detailed route description, they’ve already written a rough draft. Other writers love exploring without a map. They start writing and see where they end up. Only after they’ve written their first draft, they draw a map to check whether the route in their writing makes sense. Many writers fall in between. They like a map, but it doesn’t need to be detailed. They jot down a list of questions or bullet points to plan their writing. Imagine your reader—which problem do you help him solve? Visualize your destination—how does arriving there make your reader feel? Picture the steps your reader has to take from where he is now to where he could be. Imagine your reader following your advice—which mistake might he make? When does he resist your suggestions? By mapping out your journey, your content stays on track and you give readers a strong sense of direction. Together, you travel to a sunny destination. Mapping a journey requires one set of visual thinking skills—understanding how the big picture fits together. 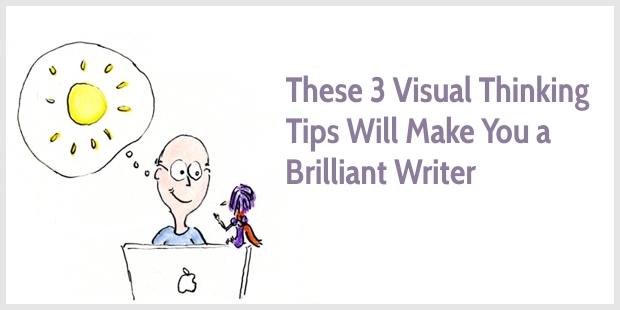 But to engage your readers, you also need to sketch vivid pictures in their mind. To sketch vivid images in your reader’s mind, imagine yourself a comic creator. How would you visualize your blog post? Which pictures would you draw? He’s browsing the web, looking for articles to share on Twitter and Facebook. Imagine your reader in the opening scene—what is he struggling with? How does that make him feel? How do his actions express his feelings? Without vivid pictures, a blog post becomes generic and boring. And without a clear map, your readers lose track. 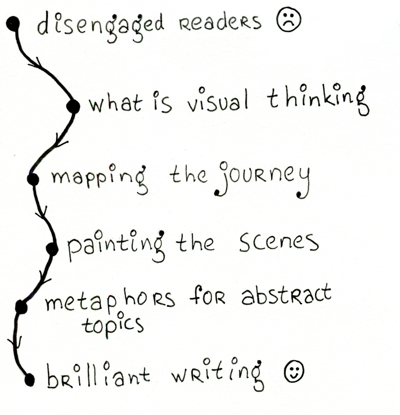 So, you need both sets of visual thinking skills to keep readers engaged. Metaphors compare two different topics, and they’re especially useful for comparing abstract with concrete ideas. Suppose each time you ran low on an item in your kitchen—olive oil, bananas, napkins—your instinctive response was to drop everything and race to the store. How much time would you lose? How much money would you squander on gas? What would happen to your productivity? We all recognize the inefficiency of this approach. And yet surprisingly, we often work in ways that are equally wasteful. (…) Multitasking, as many studies have shown, is a myth. (…) each time we shift our focus, it’s as if we’re taking a trip to the store. Friedman compares the abstract concept of multitasking with the concrete concept of grocery shopping to explain how unproductive multi-tasking is. Imagine your reader, still groggy from sleep. Can you picture her eyes lighting up? Can you imagine the smile on her face? To engage and guide your readers like that, use your natural visual thinking skills. Pick up a sheet of paper, scribble down a few ideas and draw a map. What sunny destination are you guiding your readers to? Henneke, I love this. Being primarily visual myself, I love to use mental pictures, metaphors, and stories to illustrate my points. You’ve done an excellent job showing why we need to help our readers see what we see. I’ll be sharing this with my Tribe today! Thank you for sharing, Frank. I’m glad you enjoyed this one! Never thought of a visual map to write an article but is definitely something I’ll try as I am literally doing this for the guide. Thank you, Virginia. I’m glad you like the new design! More great tips – thanks for sharing Henneke. When I was copywriting I would quite often use storyboards, especially if working on an interview piece – being a visual person it really helped! Enjoyed reading this over my morning coffee. I’m working on creating my online course today and will use visualization and create a road map for my students. Your words are always helpful and inspiring! Love the e-book I purchased from you. I’m glad you’ve enjoyed my book, Mary. I appreciate your compliment. Your blogs give that excitement which you were talking about in the mail. Thank you, Himanshu. That’s a lovely compliment! This is a fantastic article, Henneke. A mini-course on vivid writing. Your own writing is always such a great example of what you teach. I re-read it a couple of times noting how many images I conjured up as I read and it was more like watching a movie than reading a blog post. And your drawings add so much life to it! Yet another keeper for my files! P.S. The website looks great! Watching a movie rather than reading a blog post … That’s a big compliment! Thank you, Kathy. When editing this post, I was especially aware that I had to paint vivid images to live up to my own teaching, and I had to make quite a few changes! Love the comic, another option along with infographics! Thank you so much, Cathy. Recently, I’ve been having a lot of fun exploring how to combine drawings and words! WOW! What a site redesign! I love the effort you put on giving your content more visibility and the awesome sidebar-less design too. Thank you for these tips on creating a visual thinking/guide for the readers. Gosh! using abstract can do wonders to what we cannot normally describe. Thanks for the extract from Ron Friedman’s. What also fascinates me is, how do you remember those examples? The one I mentioned is of 2014 and unless you have saved that piece there is no way I could have thought it would be needed in an 2017 article. Thank you for being the “writing queen” (if I may say so) for us. The design is actually brand-new. It went live quietly last week, but today is the first time, I publish a new post on the new design. It’s still early days, so it’s hard to draw any conclusions, and I’ve not planned a test against the old design. I did some A/B testing on my old website, and I found that less clutter seemed to go hand in hand with higher conversions (even when less clutter meant fewer calls to join my snackable course). So when we created this website, I wanted the focus on the content. Thank you for stopping by again! Wow! Glad I didn’t miss a post with the new design. Yes true you need to give the change a bit of time to show result. I can’t really go sidebar-less because I do affiliate marketing and a sidebar still converts but yes the footer related posts and the categories will surely help me to reduce my sky-high bounce rates. Do you use a plugin for that or it’s hard-coded with the theme? Haha! Nice strategy to take examples. Thank you again for taking the time to answer my queries. The first part with the recommended reading is hand-coded for each post; I hand-pick the three articles. The second part with best articles by topic is a below-post widget that gets automatically added. No plugins are used. I don’t do affiliate marketing, but most sign-ups to my email list come from calls to actions in high-traffic posts. Great! I’m working on creating my online course today (like Melitta) about a writing tool. A combination of writing and meditation. These visual thinking tips really help, better than trying to put words on paper. Thanks, Henneke! Amazing how you create something useful each week! Thank you for your lovely comment, Karien. If no one has told you today that you are brilliant, please let me be the first. my eyeballs popped 3 inches out of my head and I realized I have been using the structure in my consulting work for the last 35+ years, and never until 7 minutes ago realized it is the perfect structure for my Top Candidate for Promotions Résumé Strategist blog posts. In my past life I did Organization Development interventions. The four-step process I used was IDEAL / ACTUAL / OBSTACLES / PLAN, and that is basically what you have outlined above. Funny how the solution is so often right under our noses! No longer muddling around in a mental mound of Muh, I have writing to do! Haha! That sounds like the story of my life. I can’t tell you how often I’ve been wrestling with a problem, only to realize the solution was right there, staring me in the face. Creating map sounds interesting. Going to try it. Your drawings communicate your ideas excellently. I feel easy to memorize the key message each time. Thank you so much for your lovely comment, Mehera. I’m glad you like the freshness of the new design. Brilliant post – what a fantastic way to create engaging content. I love the idea of visualizing your readers challenge and taking them on a journey in your blog post to solve that challenge, thinking about their feelings, thoughts and actions along the way. Thank you so much for your lovely comment, Laura. This is wonderful! I am going try this. I’m a visual and auditory learner so I can’t envision as much as I would like. My husband made infographs when taking courses and teacher and professors who moved around the room and ask him what he was doing A number of them told him that wouldn’t work. LOL. He also writes music in his mind. Creating infographics when taking courses sounds like the perfect way to make notes and remember what you’ve learned better. What a great idea! Thank you for stopping by, Janina. I appreciate it! That’s interesting. The blog posts I love the most are the ones I can visualize in my head. Taking the reader for a journey is certainly a great way to keep engagement. Thank you for stopping by, Raphael. Thank you very much for all your inspiring content. It adds a new dimension to the way I think about writing. You are a breath of fresh air and an eye widening experience. “Due to illness.” Not yours I hope. It’s the guy who developed the plugin who got ill and hasn’t been able to update and support it for some time. That’s why I’ve been told it’s safer to remove it from my site. Never in the history of blogging have I come across an article so clearly explained. It was an easy to visualise pathway from Hector’s first yawn. I appreciate you and the time you take to offer those gold nuggets of ‘ah ha’ moments. Wow, what a lovely compliment, Judy. You put a smile on my face! Thank you. Just love this one. I really needed this reminder, and I love the visuals. They made me smile and filled my head with images of my own. I wish I could make drawings already. ? PS I’ve noticed that you removed a share counter. ? I haven’t removed the counter. You’ve been early this time. The counter kicks in when there are 100 shares (combined on Facebook, LinkedIn and Twitter). If you come back some time tomorrow, the counter will probably be there! Wow- cool! I am going to try this. It’s been ages since I’ve revamped my writing methods. As a new blogger, I am looking for all the advice I can get! Bookmarking your blog- thanks! That’s great. Happy blogging, Laura 🙂 Thank you for stopping by. I’ve been pondering just why visual writing is so much more engaging recently. Stumbled across Barbara Oakley and V. S. Ramachandran describing humans as having proper badass visual/spatial memory systems. Sounds like we’ve got shedloads more of the grey stuff to throw at writing that bursts with images. Much less of our brain gets turned on when it’s all high-in-the-sky abstraction. So when you write visually you’re literally lighting up more areas of the brain than if you write abstractly. A helpful motivating nugget to keep in mind when writing, no? And it totally connects up with all the advice in ‘Made to Stick’. For which, thanks for the recommendation. Bloody marvellous! I read somewhere that when we read something that’s sensory, the same areas in our brains light up as when we’re really hearing, touching, smelling or seeing something. Is there a hidden recommendation in your comment? I’ve read ‘A Mind for Numbers’ by Oakley (a great recommendation by you!) but nothing by VS Ramachandran. Any suggestion? My introduction to him was through his 2 TED talks and I’d recommend watching those too (first?). He’s a superbly engaging presenter and his ideas are fascinating. He talks, for example, about the ideas he has about possible links between synaesthesia, metaphor and creativity. And I distinctly remember at one point, when he was talking about mirror neurons and empathy, having that strange out of body feeling you get when you realise your understanding of the world has just been changed forever. Congrats on the new fresh design – I like it! Alas, I’ve not been blessed with drawing skills like you, so I try to help my readers with screenshots and annotated images. Often, these convey a point more succinctly than words. I do like mapping out my posts using pen and paper though. I find it’s refreshing to get away from the computer screen and more fun to scribble and cross until the journey is clear. Thanks for sharing your writing tips. And I also love getting away from the computer screen. For me, a computer means I have to put my brain into productive mode, but when I use pen and paper, I feel more free to explore and I can come up with better ideas. Happy writing, David, and thank you for stopping by! Yes, that’s an interesting point! I hadn’t connected this to the curse of knowledge, but it’s true. Experts tend to talk in abstract terms about their expertise. Thank you for adding your thoughts, Camilla. Visual thinking is even more useful than I had imagined! What a lovely comment. Thank you, Penelope. I can picture you with a small backpack and thermos with coffee climbing up a beautiful mountain 🙂 Happy writing! Best piece of advice I ever got on writing blogs! It makes so much sense, by visualizing mapping out, draw comic like scenarios, I am definitely going to try this out for my next blog! And it’s a fun way to think about writing, too! Never thought about visual thinking until this post. Really get caught when a copy walks me through a “visual journey”. Thank you, Simon. Happy writing! Ho-ley cow, Henneke. I love this post. Mapping out your journey and turning it into a comic to get a better picture of what message you want to get across to the readers is brilliant. I mainly use outlines which doesn’t really help with the visual thinking/learning, but I’m going to try this out. Thanks a ton. Thank you so much, Andrew. I had a lot of fun with writing this post and creating my first ever comic-style drawing. Excellent tips…with visual thinking included. I can use this in producing board papers that lead to easy decision making too! Hey…why can’t I draw in this comment box? Maybe I can? I’m glad you enjoyed these tips, Charlotte. Unfortunately, you can’t draw in these comment boxes. Wouldn’t it be great if that was possible? Happy drawing! And thank you for stopping by. I just love how you write the last part of this post. It sounds like how I found this site. Thank you, Agato. I’m glad you enjoyed this one!